Today I’m thrilled to be a part of the cover reveal and first chapter preview of my friend and CP Ann Rought‘s YA debut novel Broken (January, 2013). After backhanding moisture from my cheeks, I jam my hands into my pockets and turn from the fence. We’ll never sit together again, and someday I’m going to have to accept it. He would want me to move on, not haunt the graveside his parents will never give his ashes. Heart heavy and somehow empty at the same time, I drift toward home. Fall leaves whisper beneath my steps. Jack-o’-lanterns leer from porches, glowing faces following my every step, as if they see the hollow space in me and find it familiar. The Wendell’s pumpkin is particularly vicious looking, narrow pointy teeth and angular flaming eyes, squatting like a gargoyle on the front step. Jason, a junior at Shelley High like me, really went all out with the carving this year. He’s always had a flair for dark and drama. The front porch door opens with a screech of hinges. Mrs. Wendell shuffles out, flowered house coat catching the breeze and showing her corpulent, pasty white legs. She gives me a wave and sympathetic smile when she stoops in her housecoat to blow the candle out. You can continue on with PART FOUR over at Elana Johnson‘s blog! 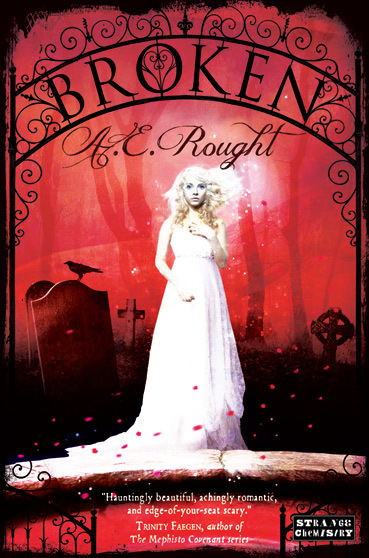 I’m so excited about Broken and its gorgeous cover. I hope you’ll hop on over to Goodreads and add it to your To-Read shelf now! My pleasure. It really is a gorgeous cover! Oh, I LOVE that cover. Gorgeous. The book sounds so interesting. Good luck with the release in January. Thanks for dropping by, Ciara!